What comes to mind when you think of someone who is free? What do they act like? What's their body language? Do they look a certain way? Now, think about someone who is disciplined. Ask yourself the same questions about that person. Got your answers? Good! When I think of someone who is free, my natural inclination is to think of a thin, tan woman in her 20s. I see her running on a beach with her hair flowing behind her- not a care in the world. And when I think of someone who is disciplined, I think of a go-getter. I think of someone who hustles hard. They follow a lot of guidelines, and maybe don't have quite as much fun, but they accomplish what they set out to do. But my first thoughts about these two types of people are not completely accurate. And not only that- they are not rooted where they should be. Interestingly enough, my view of a free person seems to come straight out of Hollywood. This tan, thin, beach-beauty is partially free because of what she looks like, and that's just not the point of freedom at all. As many of you know, my goals for the year include losing weight. So yes, I would love to be thin. And since I love the beach it totally makes sense that I would want to be tan and on a beach- because let's be real... when do I not want that?! But real freedom has nothing to do with being thin, the pigment of my skin, or my location. It doesn't even mean that I won't have a care in the world. Real freedom is rooted in Christ. It's knowing my final destination (Heaven), it's knowing the grace and love God has given me, and it is caring about the right things- the eternal things. It means caring about people in the way that God has cared for us and it's about sharing truth and being the hands and feet of Jesus. It's not about what others think of us. It isn't about what we look like, how long it takes to get married, whether or not we get married at all, or how many kids we have. It isn't about our jobs or how much money we make. Freedom isn't something we find when we work from home, when we get out of debt, or when we get away from those who hold us back. Those things are certainly helpful in our freedom journey, but they are not what makes us truly free. Real freedom is knowing God's love, loving him back, and making the most out of the life we have right now. It is finally being able to lay all worry, fear, anxiety, sin, and strong-holds at the feet of Jesus. It is trusting God and resting in him. Real freedom is enjoying and making the most of the life we are in, for the glory of God. Discipline is all about standing firm in what we have set out to do. It's about being unwavering in what we know we should do, in what we know is right, and in what we have been called to do. Discipline is sticking with what we started, and living life well. It is about being a faithful, reliable person- not just to others, but also to ourselves. A disciplined person lives as if the reward is worth the wait, and lives out the steps it takes to get there. A disciplined person sees the value in waiting, the value in doing what is right. And they hold that value above whatever instant gratification they may or may not be able to reap. Discipline is following rules or guidelines that we know are good for us, because we want the best possible life. Sometimes in my mind, freedom and discipline are at odds with each other. I know better, really, but I find that freedom always seems so much more appealing than discipline. But in a lot of ways, it takes discipline to become free. Freedom is ultimately of Christ, yet living a life a freedom means taking steps to improve the way in which we live. And taking steps towards improvement requires discipline. 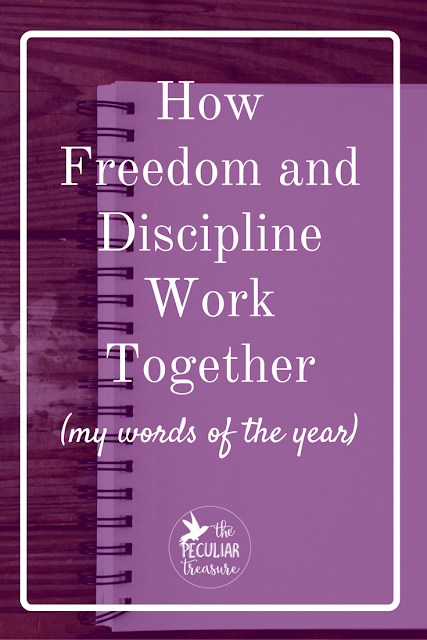 Here are a few examples of how discipline can lead to freedom. Not all of these are personal, I just wanted to give you something tangible to help. If I want freedom from my incessant addiction to food, then I have to discipline myself and keep myself from eating constantly. I am not trying to find freedom through losing weight, but rather, I am trying to be free from an obsession- an addiction. This requires discipline and leads to freedom. If I want to stop lying, I have to discipline myself to always tell the truth and come clean if I haven't. This forces me to be accountable and helps stop the cycle. I am not finding freedom in one single act, but freedom from an act that changes me as a person. Being disciplined will lead to freedom from compulsive lying. If I want to rest in the love of Jesus, I have to stop trying to find it in other places. 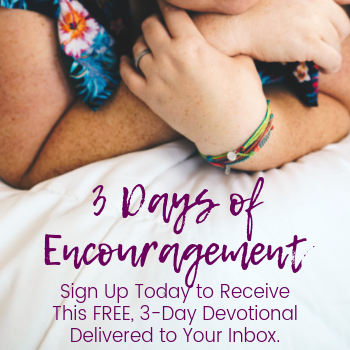 I have to discipline myself to stop seeking the approval of others, stop putting so much value in "things" and "possessions" and actually start believing that God's love for me is far beyond anything else in life. It requires that I stop seeking compliments for everything good I do, that I stop seeking love from anyone and everyone who will give it, and that I stop compromising who I am for other people. This takes discipline, but leads to freedom. Freedom and discipline are good friends. They pair up perfectly to help us achieve what we have set out to do. Discipline is the catalyst that bring us into a place of true freedom. Discipline doesn't always have to be synonymous with "hustle". You can discipline yourself to be at peace, to enjoy life, and to rest in Christ. Discipline is simply doing what you know you need to do and what you know is best, in order to become who you are meant to be in life- which leads to freedom. Before I decided that these two words would be my words of the year, I had not really thought through how these two concepts work together, but I am glad that I did. There are so many things in my life that I want to be free from, and discipline is the way to that freedom in almost every case. And something tells me you can relate. Why? Because a search for freedom is part of being human. We may have never put it into words, but we all crave it. So maybe this year, we can work together to discipline ourselves in order to find freedom. What do you say? It's funny how "freedom" and "discipline" are considered to be so separate from one another when they actually go hand in hand. Thank you for this reminder today. Very fitting for the new year and for new beginnings. 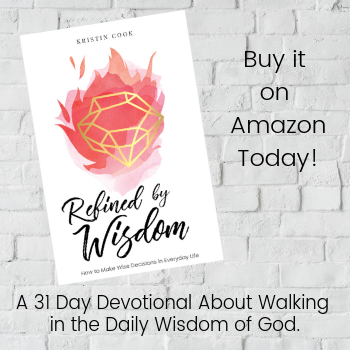 Kristin - as I was reading I was so happy to get to the part about real freedom only being found in Christ. It's such an encouragement to the rest of us who aren't famous, rich or models. 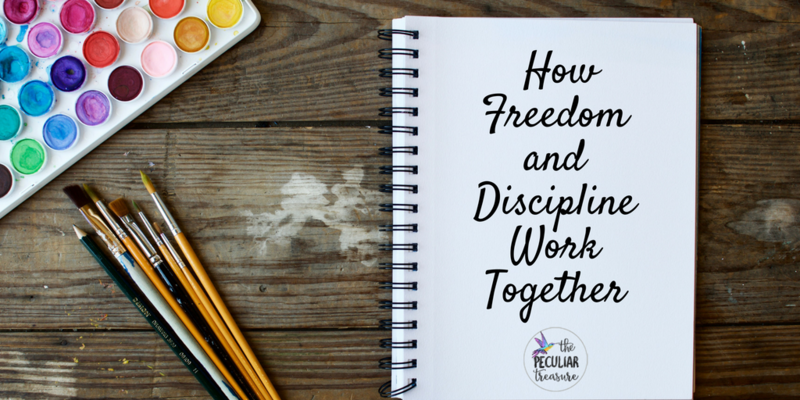 I also love how you tied freedom and discipline together - that's not an easy task! This is ridiculously obvious, but I never though of it like this! This is a very nice article, I love it! I love how you paired these two together! Most of the time you would not think of them as being friends. They are both great to remember as far as working towards your future goals. I also want to lose weight this year. I know we can both accomplish this goal!! Good luck with your words of the year. 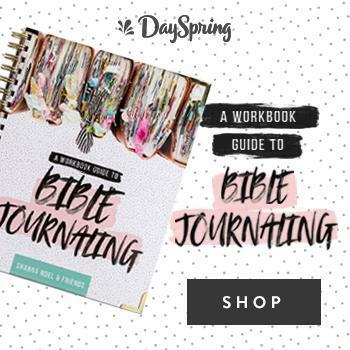 Can't wait to hear about updates to how you're accomplishing them! Girl, YES. This is so good. Something a lot of us miss! You are spot on Kristin! Love this! I love this SO much, Kristin! 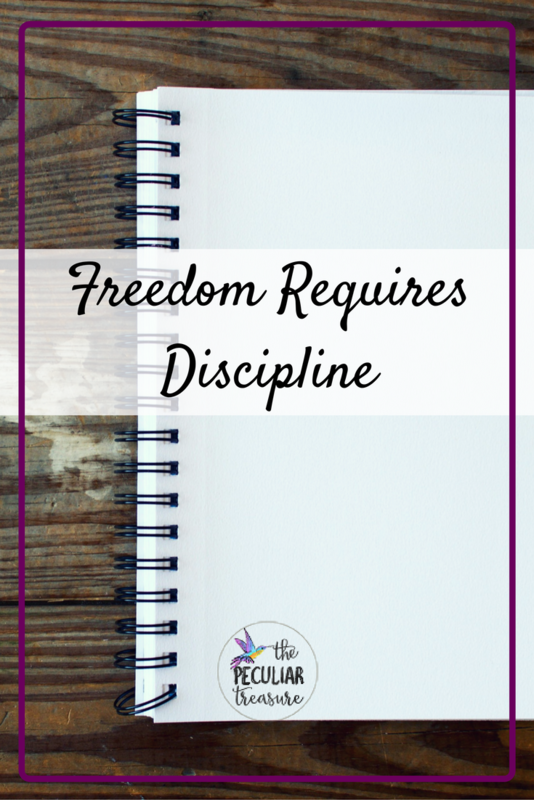 So often we think of true freedom as being free from the need to be disciplined, but discipline is a tool to help us achieve greater freedom in Christ. This is a great post! Finding the perfect balance between freedom and discipline can be tough at first but once you find it it is a beautiful thing. I loved the 3rd example. Beautifully said and a wonderfully written article! Great article! So many good points. Dicipline is my word for this year so when I saw the title, I had to read it. And I'm glad I did.